As churches of Christ continue to experience transitional conflict, fundamental commitment to biblical authority wanes, and personal taste and affective creativity assert themselves. Our current social milieu and cultural climate exacerbates and reinforces this increased reliance upon self and personal opinion as legitimate standards of authority. Despite the mad rush to the left in politics, religion, and morality, the faithful Christian is one who remains unshaken by the winds of change (Matthew 11:7; Ephesians 4:14). As change agents proudly and defiantly orchestrate restructuring of values and foundational principles, the faithful follower of Jesus Christ consistently reaffirms the ancient, bedrock truths of biblical religion. The promoter of change is most conspicuous in his relentless assault upon pure worship—a typical, perennial ploy of Satan (e.g., Genesis 4:3,5; 1 John 3:12; Exodus 32:8; Leviticus 10:1-3; 1 Samuel 13:9-13; 1 Kings 12:28-30; 18:4; 2 Kings 22:17; 2 Chronicles 26:16-18; Psalms 78:58). Since, by definition, worship changes are not rooted in or sanctioned by Scripture, whence do such innovations arise? Obviously, if these items do not find their origin in Heaven, they must originate with man (Matthew 21:23-25). The human heart, unrestrained and unenlightened by divine guidance, inevitably pursues behaviors and practices that satiate fleshly appetites. Handclapping also has been introduced into worship assemblies in the form of applause [NOTE: see the defense of applause in Norton, 1992]. The congregation is drawn into applause following baptisms, sermons, and other worship events. Probably most advocates (as well as opponents) of applause in our worship assemblies base their opinion on extrabiblical grounds. Those who are for applause say: “What’s wrong with it? I like it! It’s just an updated, modern way to say, ‘Amen.’” Those who are against applause say: “We’ve never done it. I’m uncomfortable with it. It cheapens solemnity.” Surely, a more biblically-rooted critique of handclapping is in order. 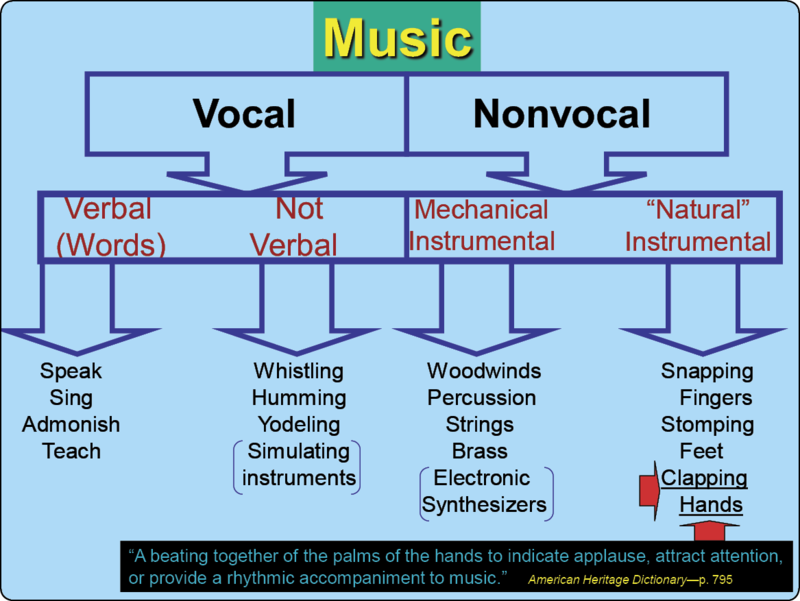 What is the significance of handclapping in American culture? The primary function of applause is to indicate personal approval. Webster’s dictionary defines “clap” as “to show pleasure at or approval of” (1965, p. 333). “Applaud” means “to praise or show approval of, commend” (p. 89). We applaud performers at football, baseball, and basketball games. We applaud musicians at concerts. We applaud actors and actresses at theatrical performances. We clap our hands on such occasions because we like what we see and hear. We personally enjoy and agree with what we observe. Clapping is a way for us overtly to validate and affirm our opinion of the performance. A third function of handclapping is expression of excitement. We sometimes burst forth in spontaneous applause because we are personally excited, moved, or thrilled by a performance. In this case, handclapping is an outlet, a means of catharsis, a way to achieve emotional release, and a way to express joy. A fourth function of applause is to manifest courtesy. For example, academicians clap their hands at the conclusion of the reading of a scholarly paper—not necessarily to convey or imply agreement or approval—but to be polite and courteous. Politicians on both sides of the aisle in congress applaud the President as he delivers his State of the Union speech. Clearly, this applause is a demonstration of etiquette—not agreement. How does handclapping in American culture correlate with scriptural worship activity? To answer this question, two additional questions must be answered: (1) Is handclapping a legitimate replacement of, or alternative to, saying “amen”?, and (2) regardless of whether handclapping appears to be parallel to “amen,” does God approve the use of handclapping in worship? Our English word “amen” is a transliteration of a Hebrew word that means “firm” (see Thayer, 1901, p. 32; Dana and Mantey, 1927, p. 259). The root stem meant “to show oneself firm and dependable; to know oneself to be secure, have faith.” Thus, the term means “certain and true.” The Israelite would say “amen” in order to confirm or identify himself with a particular verbal declaration (Brown, 1975, 1:97). “Amen” served to affirm a statement as certain, valid, and binding (1:98). The use of the term in the Old Testament may be summarized as “an acknowledgment that the divine word is an active force: May it happen in just this way” (Botterweck and Ringgren, 1974, 1:321). Similarly, “amen” has reference to words and deeds of God to which the speaker submits himself (1:321). The Septuagint often translates the Hebrew word for “amen” as “genoito” (“may it be”), which “signifies what endures or is true, the spoken Word of God in the sense of its standing fast” (Kittel, 1964, 1:336). H.B. Hackett commented that “amen” in the Old Testament was “a word used in strong asseverations, fixing as it were the stamp of truth upon the assertion which it accompanied, and making it binding as an oath” (1896, 1:82). So “amen” had essentially two uses in the Old Testament. First, it signified the individual’s acceptance (even sworn oath) of the statement (e.g., Numbers 5:22). In Deuteronomy 27, the people gave assent to the conditions under which a series of curses would be inflicted upon them for disobedience. Second, “amen” connoted truthfulness (1 Kings 1:36). Jesus used the term in this fashion as a prelude to His remarks, translated in the NASB as “most assuredly” (John 3:3,5,11). Interestingly enough, the Old Testament refers a few times to the clapping of the hands together. [NOTE: Keep in mind that authority for handclapping in worship today cannot be secured from the Old Testament, any more than authority for other practices, including dancing, instrumental music, and burning incense. Yet, those grasping for justification for their innovations make the same argument for handclapping that is made for instrumental music. See J. Carroll Stark’s rationale during his debate with Joe Warlick in 1903 in Henderson, Tennessee in William Woodson (1979), Standing for Their Faith (Henderson, TN: J. & W. Publications), p. 90.] Handclapping sometimes occurred in the Old Testament as a cultural (not religious) expression of joy. For example, handclapping occurred at a coronation (2 Kings 11:12) or a military victory achieved for the nation by God (Psalm 47:1)—neither of which provides support for Christian worship. Used figuratively, even rivers and trees clap their hands (Psalm 98:8; Isaiah 55:12). But the most prominent use of handclapping in the Old Testament was as a manifestation of disdain, repudiation, and ill-will (Job 27:23; 34:37; Lamentations 2:15; Ezekiel 25:6; Nahum 3:19). Will the advocates of handclapping in the worship assembly urge this use of handclapping, along with boos, hisses, and catcalls? (cf. Orr, 1939, 1:665). In the New Testament, “amen” is found 126 times. Two additional Greek terms are used to represent the same concept. The three are translated “so let it be, truly, amen” (Arndt and Gingrich, 1957, p. 45). Jesus often prefaced His remarks with a double amen, translated “Verily, verily” or “truly, truly.” In so doing, He affirmed that His sayings were reliable and true, valid and certain (Kittel, p. 338; cf. Brown, 1975, p. 99). Summarizing the New Testament evidence, “amen” was a vocal means by which an individual affirmed the certainty, truthfulness, and reliability of God’s Word. To say “amen” was to confirm the binding nature of those truths. To a lesser extent, the speaker was expressing assent and endorsement with the accompanying intention to submit himself to God’s truth. Notice that the functions of handclapping in American culture do not match the biblical function associated with saying “amen.” Handclapping in our culture carries additional baggage than that which “amen” carried in the Bible. Applause in our society is generally a response to an entertaining performance. Our applause is focused upon the performer. We are showing approval and recognition of the performer’s talent, while expressing our own personal excitement and pleasure. Consider the comments of United Methodist bishop William Grove of Charleston, West Virginia, who considers applause inappropriate in worship because it turns the church into a theater and confuses people about the focus of worship (Clarion-Ledger, 1992, p. 3). In stark contrast to this emphasis, the use of “amen” in the Bible focuses upon the message rather than the person presenting the message. “Amen” enables the worshipper to assert publicly the truthfulness of the spoken Word. “Amen” is not designed in any way to affirm the speaker, and thereby place him in the position of being a performer. Indeed, we ought not to extol or call attention to the vain talent of the preacher, nor praise his skilled “performance.” God wants our attention centered on the meaning of the message. God wants us to focus on the fact that God’s Word is being declared and, unlike man’s word, that it is notable and unique in its truthfulness, certainty, and rightness. Why applaud at a Baptism? 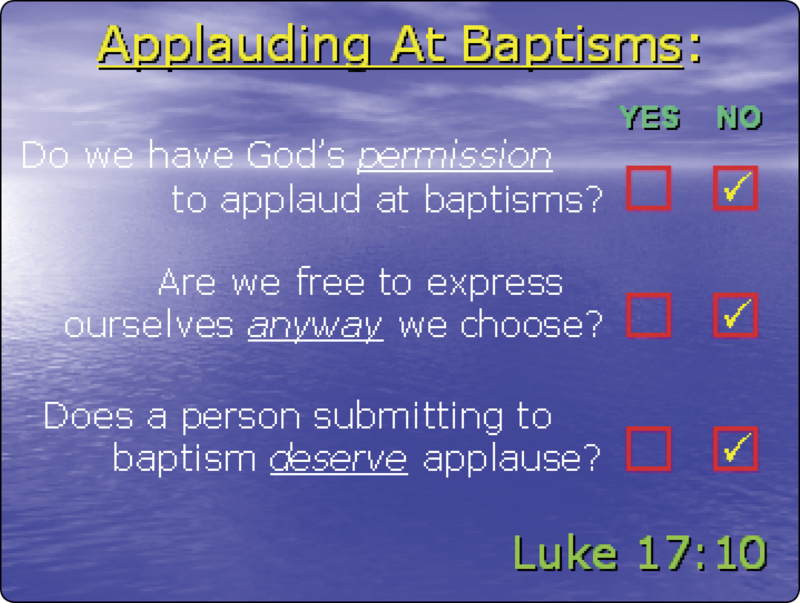 We must surely ask: why would we desire to applaud at a baptism? Are we implying that the one submitting to baptism deserves applause? Does anyone deserve applause for obeying Christ—for doing what every accountable person on the planet is obligated to do? We need a healthy dose of Jesus’ own assessment of our obedience: “So likewise you, when you have done all those things which you are commanded, say, ‘We are unprofitable servants. We have done what was our duty to do’” (Luke 17:10). Further, applauding at a baptism implies that we are free to express ourselves any way we choose to do so—without regard to whether God is pleased with our behavior. If one person may, without God’s permission, applaud the person who is baptized, then another may feel perfectly free to jump up from his pew, throw his fist in the air, and proclaim, “Yes!! All right! Way to go!” Still another may step out into the aisle and dance a jig. The entire congregation may choose to enact a “holy wave” reminiscent of the wave at football games, starting on one side of the auditorium and spreading across the assembly to the other side. Does the Bible teach that God is pleased with human’s expressing their feelings by any means? It does not (e.g., Jeremiah 10:23; Psalm 50:21). Notice the inconsistency of loose thinking and action—action that arises from human inclination and feeling rather than from a thoughtful, respectful consideration of God’s Word. If we applaud one who is baptized, then it follows that we ought to applaud the song leader. After all, he, too, is obeying Christ by serving in a significant role as a worship leader. But if we are going to applaud the song leader, then we also need to applaud the prayer leader, the scripture reader, the men who serve on the Lord’s Table, and the preacher. Observe at this point, our rationale has led us into creating a worship environment that amounts to a mutual admiration society in which we are applauding each other. In the midst of such worldly, self-centered displays, attention to God—the true focus of worship—has gone by the wayside. The fact of the matter is that handclapping is a secular response/reaction to human performance. It betrays the extent to which we have been influenced by the world. It is a worldly, unspiritual practice. We ought to be ashamed for even trying to defend emotional, human exclamations as God-originated or God-approved. If we are free to clap our hands in worship when we get excited, then we are free to scream, squeal, and shriek; we are free to turn somersaults down the aisle; we are free to stand on the pews and stomp our feet; and we are free to jump up and slap our hands together (like athletes) in the “hi-five” position. Likewise, we are free to boo, hiss, or throw tomatoes if we are not impressed with those conducting the worship. All such behaviors (though acceptable in a secular, entertainment-oriented context) in religion are unauthorized concoctions stemming from the unrestrained, unguided minds of mere men. They fail to respect, honor, and sanctify God as He instructs (cf. Leviticus 10:3). They reveal our human propensity to formulate worship behavior according to our own desires. When Christianity became fashionable the customs of the theatre were transferred to the churches. Paul of Samosata encouraged the congregation to applaud his preaching by waving linen cloths. Applause of the rhetoric of popular preachers became an established custom destined to disappear under the influence of a more reverent spirit (“Applause,” 1957, 2:138, emp. added). Paul of Samosata was an elder in the church in Antioch around A.D. 260. Eventually censured for his practice, he did for the church of his day what the agents of change are doing for the church in our day. He introduced an unbiblical, unauthorized action into worship—an action that has no genuinely spiritual value, but which, in actuality, promotes a secular, fleshly approach to worship. History is repeating itself: “for they loved the praise of men more than the praise of God” (John 12:43); “How can you believe, who receive honor from one another, and do not seek the honor that comes from the only God?” (John 5:44). May we learn to find contentment and satisfaction with the simple ways of God articulated in His Word. May we feel constrained to fashion worship behavior and religious ritual in strict compliance with His instruction. May we love Him enough to set aside personal preference, and to subdue emotional inclination, in exchange for the delightful, exciting, stimulating directions delineated in Scripture. May His words be ever in our hearts and on our tongues. Amen. “Applause” (1957), Encyclopedia Britannica (Chicago, IL: Encyclopedia Britannica). Arndt, W.F. and F.W. Gingrich (1957), A Greek-English Lexicon of the New Testament (Chicago, IL: University of Chicago Press). Botterweck, G. Johannes and Helmer Ringgren, eds. (1974), Theological Dictionary of the Old Testament (Grand Rapids, MI: Eerdmans). Brown, Colin, ed. (1975), Dictionary of New Testament Theology (Grand Rapids, MI: Zondervan. Clarion-Ledger (1992), Jackson, MS, May 30, D1, as quoted in Preacher Talk, 8:3, June. Dana, H.E. and Julius R. Mantey (1927), A Manual Grammar of the Greek New Testament (Toronto: Macmillan). Hackett, H.B., ed. (1896), Smith’s Dictionary of the Bible (Boston, MA: Houghton and Mifflin). Kittel, Gerhard, ed. (1964), Theological Dictionary of the New Testament (Grand Rapids, MI: Eerdmans). Miller, Dave (2012), Surrendering to His Lordship (Montgomery, AL: Apologetics Press). Norton, Howard (1992), “Extremists Tend to Blur Biblical Boundaries,” The Christian Chronicle, 49, June. Orr, James, ed. (1939), International Standard Bible Encyclopedia (Grand Rapids, MI: Eerdmans). Postman, Neil (1985), Amusing Ourselves to Death (New York, NY: Penguin Books). Thayer, Joseph H. (1901), A Greek-English Lexicon of the New Testament (Grand Rapids, MI: Baker, 1977 reprint). Webster’s New Twentieth Century Dictionary (1965), (New York, NY: World Publishing), second edition.